Armenia and the European Union formally initialed on Tuesday the text of a new agreement on deepening their political and economic links. Their negotiations on the Comprehensive and Enhanced Partnership Agreement (CEPA) were concluded ahead of President Serzh Sarkisian’s visit to Brussels late last month. “The Agreement will be an important step to broaden the scope of bilateral relations between Republic of Armenia and the European Union,” the two sides said in a joint statement issued after their senior negotiators initialed the deal at a ceremony in Yerevan. 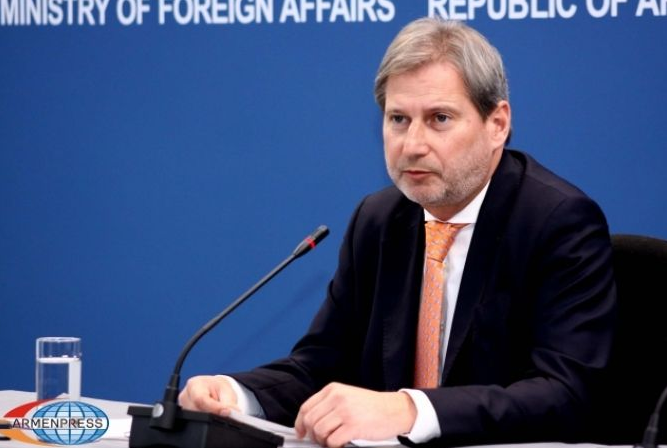 The CEPA is meant to serve as a less ambitious substitute for an Association Agreement negotiated by Armenian and EU officials in the summer of 2013. Sarkisian scuttled that agreement with his unexpected decision in September 2013 to make Armenia part of the Russian-led Eurasian Economic Union (EEU). The U-turn was widely attributed to strong Russian pressure. The alternative deal, which has not been publicized yet, apparently contains the main political and some economic provisions of the cancelled Association Agreement. But it has no free trade-related component due to Armenia’s membership in the EEU. “Our people regard themselves as Europeans,” Sarkisian declared during his trip to Brussels. He said “shared values” are at the heart of the CEPA. In that context, he reaffirmed his administration’s pledges to ensure that Armenia’s upcoming parliamentary elections meet democratic standards. Earlier this year, the EU provided Armenia with over $7 million in funding for the purchase of special electronic equipment designed to prevent some forms of electoral fraud.